So by now, you've seen that my friend Dino has managed to convince me to begin posting on Speedhunters. 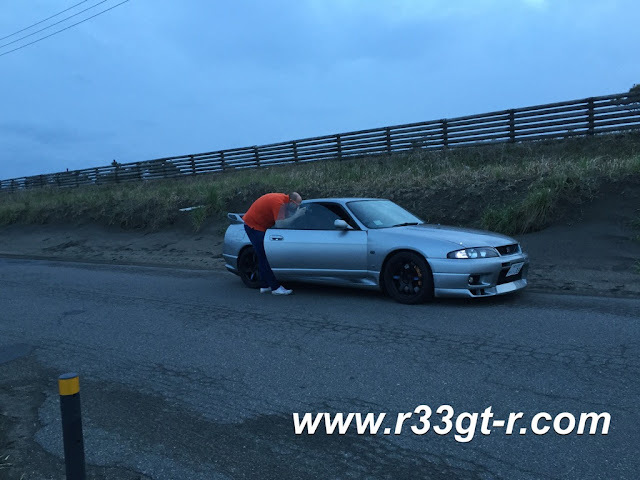 As I stated in that post, the main reason is to show everyone how great a car the R33 GT-R is, despite the lack of attention compared to the R32 and R34. What better way to reach, and educate, the masses? And yes, I expect the haters to come out, but I also expect the fans to come defend the car as well. We shall see. No doubt this will be interesting, but it won't stop me. In any case, what you will begin seeing is that the Speedhunters posts I do will be photo intense, as befitting the Speedhunters theme. Since I know nothing about photography, and I have no intention of aspiring to be a "pro" like some people out there, I am hoping the "full auto" setting on my Nikon DSLR will be able to produce some nice photos. I will continue to blog here of course, and here I will go into more detail about the mods I do and the adventures I have. In addition, I expect there to be some posts that are not featured on Speedhunters at all, either being too nerdy/OCD or historical pieces like the one I did comparing the R34 GT-R with the R33. I think this shot didn't end up making it...maybe because it shows our two kids in the back seat? This one came out beautifully. I can see why it isn't just point and shoot. So yes, the fact I have these photos means that, back in April I knew something was up. Believe me I'm happy to be able to post on Speedhunters, I'm sure many would give their right arm to do so. So, I have to thank Dino for the opportunity. But now, the pressure is ON. Not only to post, but to find more new and interesting parts to fit to my car in my quest for "balanced refinement" which as you know has always been my theme. So if you guys, my loyal and original readers, have any ideas, please let me know! Better yet, if you know of someone or some company itching to get their product featured on Speedhunters, AND of course it works on the R33 GT-R, send them my way please! Of course will give proper credit for ideas and referrals on Speedhunters, so long as they let me!! Yes, finally. Honestly, you deserve to be there. Happy to see another source where I can read about your car. Is the car coming for sale? Anonymous - I wasn't planning on it, but if you are interested email me with your offer. Actually I get many offers all the time so yours would have to be a very good one lol. EthosVeritas - feel free to ask questions or make comments if you have ideas! Thanks! Greetings from Malaysia. It has been a while since I last checked your website at r33gt-r.com but I still often checked out your posts at your Facebook page. I found your website back in 2010 which I am quite impressed with the things that you have done to you BCNR33. I was 17 years old back then and I din't really understand much about the technical stuffs that you are doing with your car. But today, I learned more about cars than I was before and I found your website to be more inspiring than before. Learned a lot of things about BCNR33 from there. I'll spend more time to catch up on the many posts in your website that I have missed out. Also, I have just started to read about your IS F in your new website few days ago. Done reading about the IS F today. Thank you for your kind reply, Aki. The Lexus one is interesting. From there, I learned about how professional Lexus services is in Japan. I've been to one of their roadshows before in my country, Malaysia and their staff courtesy is indeed very pleasant and professional. I also learned about the how things work in Japan such as your post about getting an approval from the Japanese government regarding the availability of parking space and the one about ORBIS. Certainly enlightened me about how things work out in Japan. On a separate matter, I do enjoy the way you write your posts. It is very reader friendly and informative especially your detailed explanation on how do you get your things done in Japan. Thanks once again, Ken! Glad to see someone appreciates and can learn from what I write. And I am glad that my writing style works - indeed I try to write as naturally as possible. So again thanks! Hey mate, i spent so much time reading this blog ( killed alot of time at work), all i wanted to say is im a big fan of it and if you could keep on updating it with heaps of pictures of your car it would be great! Many thanks for the humorous comment! Glad you are enjoying this blog, hope you don't get in trouble at work, LOL. I have, of course, several projects in the pipeline but as a working stiff, time is the issue. But yes, lots of pictures will be taken, the best ones put on Speedhunters and the not so good ones (that help tell the story) will be here! Stay tuned and thanks again! Ahhh and to think I knew you before you were famous! Nice work Aki am pleased for you.